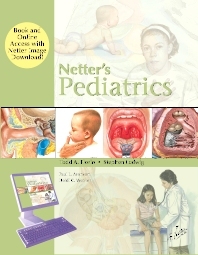 Netter’s Pediatrics, edited by Drs. Todd Florin and Stephen Ludwig, is a rich visual aid with more than 500 images by Dr. Frank Netter and other artists working in his style that will help you diagnose and care for children with common clinical conditions. This is the first time that Netter’s drawings of pediatric illness are brought together in a single volume. The superb, accurate artwork accompanies up-to-date text contributed by physicians at the prestigious Children’s Hospital of Philadelphia. The book provides you with all the at-a-glance information you need for a quick overview of common issues from nutrition, allergy, infectious disease, and adolescent medicine, to cancer and heart disease. In addition, you can easily and quickly search the book’s full contents online, download the illustrations, and print patient education handouts at www.NetterReference.com. Easily access the full contents online at www.NetterReference.com, download Netter images for use in your personal presentations, and print handouts for patient education.